Andy's just been dumped by his girlfriend. Your task in this tearful romantic comedy is to help him get her back. Thanks to Steve McCrea for hosting the main download link. I do enjoy a good feature-length Adventure Game where you get points on the way through. As others had said, this is a bit tongue-in-cheek, but at the same time it is quite lovable too. This game is for the young men, that can't chase the chicks in a real life. Good game - the puzzles were just tricky enough to be interesting without frustrating the hell out of you! Interesting humour - probably not that different to your average campus. Very nice and entertaining game! good graphics and equilibrated puzzles... funny story and interesting endings, the only thing... I couldnt achieve maximum score... maybe I missed something? Can't be compared with Larry games. If you like Larry, you just might get something out of this game. 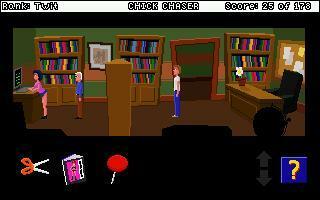 Chick Chaser is a great, light hearted romantic comedy adventure, a sort of Leisure Suit Larry with morals. As the title would suggest, the game's male characters have a rather caveman like view of females but as the game progresses they generally learn their lesson and to get the best ending you have to overcome animal lust to prove your true love. As well as abhoring the view of women as pieces of meat, the game also includes some other optional puzzles in which you are faced with a moral choice with various consequences. You can die or get a bad ending in this game so save often. As the recent He's Gone Historical showed us, a university campus makes a superb setting for an adventure game and Chick Chaser makes the best use of this setting yet. From dorm rooms, offices and librarys to gyms, sports fields and of course the student bar, Chick Chaser delightfully recreates the atmosphere of the university years. The storyline is enjoyable and lengthy with plenty of puzzles to take on and a less than rigid order in which you have to complete them. This means you are free to wander the campus at your leisure. Attractive graphics makes this a great experience. All in all, Chick Chaser is set to become an AGs favourite. Its an extremely playable, irreverent Larry tribute but with a heart and a conscience which makes it infinitely more likable. A great game and good puzzles! This game was as much fun as Al Gurbish... The story was good, the puzzles made sense and I liked the graphics. Great Job!! Really enjoyed playing this game. Loved the university setting and the storyline in general. Well done! Just managed go get the best ending of the game. Really an enjoyable and long game :) But its humour isn't for everyone.